Mes amis, it was a long night. World champions, a second star on the jersey and, naturellement, the celebrations were long and loud and joyful. I found myself in the changing room with the players after the game and the air was thick with laughter and song and then a certain dizziness, too, as the result began to sink in. I embraced my old friend Didier Deschamps, still soaked to the skin from the rain-drenched trophy ceremony. He was in a state of euphoria – he had done it! By leading Les Bleus to a second triumph, 20 years after being our captain when we won the World Cup in France, Didier became only the third man to have won the competition as both player and manager. He’s in rare company, alongside Mário Zagallo and Franz Beckenbauer, but when he was reminded of the fact he just shrugged, smiled and said those two were far better players than he ever was. Typical Didier, that. Deflecting the praise, trying not to take himself too seriously. Humble. But this triumph for French football is very much his. Didier has crafted a team and a spirit, very much in the way Aimé Jacquet did with us in 1998. Just like 20 years ago, when Aimé decided to do without Eric Cantona and David Ginola, so Didier opted to leave out Karim Benzema, arguably France’s most talented No 9. Just like 20 years ago, critics complained about the style of play and a lack of French flair but, just like Aimé, Didier’s mindset is all about results. It’s all about winning and Didier set up his teams accordingly. The players threw Didier into the air after the game and later stormed his press conference, throwing water over everybody and chanting their manager’s name. But it wasn’t just water they poured over him, it was praise, too, and you could see they knew how much they owed him. It was touching. For these young players, being world champions will take a bit of time to really sink in. Little by little they will realise what they have achieved and the significance of it all. They got a glimpse of what it means to people on Monday when they paraded along the Champs Élysées in front of hundreds of thousands of partying supporters. They are world champions for life. In England many of you can name the World Cup-winning team of 1966, despite it being such a long time ago and the fact most of you probably weren’t even born. 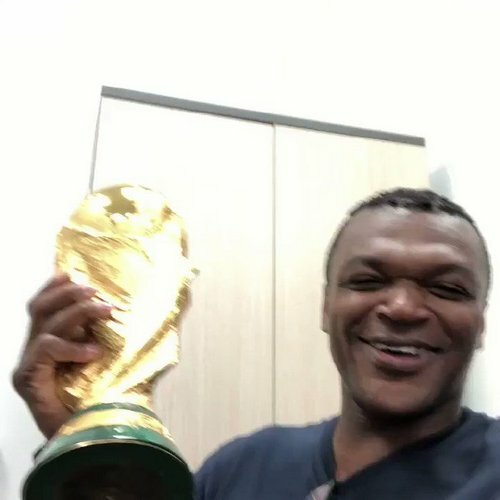 In France, nobody has forgotten the names of the 22 players who won our first World Cup and several of us were lucky enough to be in Moscow to see first-hand this new group add their names to history. For the likes of Laurent Blanc, Lilian Thuram, Didier and me the World Cup was a kind of consecration – we had already won lots of trophies with our clubs and were experienced players. It’s different for this France team. For many of these youngsters the World Cup is almost the first thing they’ve won! Which makes me think France are looking good for the next few years. When we won in 1998 it gave us tremendous belief and we became a much better team afterwards – think back to how we dominated England a year later at Wembley with a couple of goals from Nicolas Anelka. Remember Euro 2000, when we played much more attacking football than two years earlier. No wonder Didier will stay on as France manager – he can sense the potential he has at hand. Many of these players will be even better in two or four years’ time. Didier left talent such as Alexandre Lacazette, Kingsley Coman and Anthony Martial at home but they are still young and we have plenty of other players coming through – Clément Lenglet just joined Barcelona from Sevilla and is a fine defender. The future is really bright for France. Some of the other nations have a lot of work to do. Probably the biggest disappointment for me at this World Cup was Argentina, with Diego Maradona and his grotesque gestures just about summing it up. What a waste of talent this team represents. But the word “team” is the wrong one to employ here, that’s the problem. This is a country that has always produced top-class footballers but this World Cup just underlined that they are at the end of a cycle and they need to start over. So many good players but no team – I was very disappointed by them. I was saddened, too, that no African team managed to get past the first round. Sure, there were glimpses that could provide optimism – Nigeria weren’t far from the second round, Senegal shone at times and Morocco didn’t have much luck on their side. But, and I’m putting my Ghana hat on here, we really need to work out a way to get better results at the World Cup. There has never been an African team in the semi-finals and we need to ask the right questions to help put that right. Maybe the qualifying system needs an overhaul? Perhaps we should adopt a South America style of qualifying? One thing’s for sure – Africa needs to have its best teams at the World Cup. There is a meeting in Rabat this week to discuss the state of African football and I hope something positive comes out of these talks. Another thing that struck me at this World Cup was just how difficult it proved for individuals to shine. Sure, we had a Cristiano Ronaldo hat-trick and an amazing Lionel Messi goal but globally it wasn’t a World Cup for individuals. Messi, Ronaldo, Neymar, Luis Suárez, Robert Lewandowski all struggled to shine. This was a tournament where teams proved stronger than individuals, which is why Luka Modric deserved the prize of best player at the tournament. He was immense at this World Cup and is a real team player, of course. Modric brings out the best in others, creates space for his teammates and performed at a consistently high level throughout. Before the tournament began, many wondered how it would be in Russia. There were security fears after the frightening images and incidents at Euro 2016 involving Russian hooligans. But I have to say that the Russians organised a great tournament. People were very open, very welcoming and I felt there was a genuine curiosity as the country opened its doors to so many foreigners coming to support their teams. The enthusiasm was a really welcome surprise for all of us who were discovering the country. Let me finish by coming back to the celebrations that followed the French victory. Any team that wins a competition will celebrate, of course, there’s nothing more normal. But the scenes we witnessed over the past couple of days underlined the great atmosphere in the French camp and it gives us a timely reminder of the importance of team spirit. England went further than expected with their best performance in years and we all saw how Gareth Southgate had created something special in the England camp. The opposite to what was going on with the Argentinians. It’s much easier to fight for your teammates when you get on well with them, when there is harmony in the squad. After the final in Moscow we were treated to some great scenes. The France players sang with us in the changing room, danced around the French president and filmed each other non-stop in general hilarity. Of course we partied 20 years ago after our triumph but you can see the difference with this generation. Whereas we were sometimes still shy in front of the media, in front of the cameras, this generation has grown up with social media. Most of them film each other all the time and are totally at ease in front of a camera. Their attitude is refreshing and the way they spoke, too. Fun and laughter, of course, but respect, too. Respect for each other, for their coaches and for the country that unites them – some powerful words were pronounced. Welcomed back to France by President Macron at the Élysée Palace, the players gathered round the presidential couple for a group photo and Olivier Giroud launched the singing of our national anthem, la Marseillaise belted out by the players at the top of their voices. Later, in the Élysée gardens, hundreds of kids from the local teams the France players started out at were treated to a rousing speech from President Macron, who reminded the players to never forget where they came from. Paul Pogba took the microphone and soon everybody was singing the N’Golo Kanté song. It was the beginning of another long night.